Oh sacred Head, what glory, what bliss till now was Thine! What Thou my Lord has suffered was all for sinners gain. Lo, here I fall my Savior. ‘Tis I deserve Thy place. These are the first two stanzas of an ancient and dearly beloved hymn. It has been sung by believers for centuries, and is still true and relevant, and I cannot sing it without being close to tears. The melody, written by H.L. Hassler (1564-1612) and arranged by J. S. Bach (1658-1750), is dignified and solemn and worthy of the lyrics, (attributed to Bernard of Clairvaux, c. 1150), which call us to remember the agony and grief of the Lord as He hung on the cross. Knowing that it should have been me there, and knowing that He deserved none of this ~ but had taken it willingly on Himself for the sake of His love for me ~ it is almost unbearable. Around this time of year I often receive devotional e-mails from Christian friends recounting the horrible details of the crucifixion of Christ. First, the physical details: the torture of the scourging; the lashes each with their sharp metal tips to insure the ripping open of the flesh; the details of the nailing process; what happens to a human body hung in such a way; the full body weight suspended by the nails and what that does to the internal organs. The crown of thorns, the vinegar to drink. Then, there is the mental side: the mocking and the taunting, the desertion by most of His followers; the derisive sign above His head: “Behold the King of the Jews!” There is the final, ultimate pain: the complete separation from the Father as the Lord Jesus received the consequence of my sin on Himself. Looking at this terrible scene through human eyes, it would seem to be an unspeakable tragedy. Christ was dead; the promise which He had brought to the world of a new order, a new relationship to God, was over. I am sure His followers thought He would fade into history as a brief flicker of light which had flamed out, and they would be left with only questions and self-doubt about their trust in Him. What a day of confusion and triumph! There were those who loved Him coming to the tomb with their prepared spices and oils in order to minister to the body; the angel’s astonishing declaration the He had risen! The empty tomb and the discarded grave clothes. The joyous realization that all was not lost! He is alive! 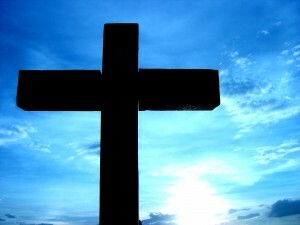 He had not perished, but has triumphed over death and Satan and has made the way clear for us to be reconciled to God. By His death and resurrection, we are no longer at enmity with God, but free to come into His Presence and worship. “Christ the Lord is risen today! Alleluia! Raise your songs of triumph high! Alleluia! He was seen many times after the Resurrection, and He had to show them His mutilated hands and feet so that they could believe that it was really He who spoke with them. He continued to teach them and open their understanding of all that had occurred. Finally, at Bethany, He was taken up into heaven. Since His Ascension, He waits in heaven to receive us. We now wait in hope to see His coming again to take us to be with Himself, and finally to see His triumph when He shall reign forever and ever! “Look ye saints, the sight is glorious. See the man of sorrows now! From the fight returned victorious; every knee to Him shall bow. Crown Him, crown Him; Crowns become the victor’s brow! Hark those bursts of acclamation; Hark those loud triumphant chords! The good news of Easter is the cornerstone of our faith. Not only has Christ made it possible for us to be reconciled to God, but the Resurrection confirms the joyous truth that we will be with Him in eternity. Death and Satan have been defeated; Christ is triumphant and in heaven preparing a place for us! Happy, happy Easter! Behold our King… and our God! Barbara, I just have to say that God has gifted you with a wonderful talent for writing. Your columns always touch me in some way.